I’ve always wanted to be in the circus. Coming from a carnie family, the desire to run away with a caravan runs deep. Don’t get me wrong; I wouldn’t trade my SCT family and the life it has allowed me to lead for anything. Buuuuuut if some sort of Quantum Leap happened and I got to live in a tiny trailer next to a trick seal, I wouldn’t complain. Which is why, in my spare time, I have frequently devoted myself to learning some sort of carnie sport. I watched jugglers, bought scarves, and tried teaching myself. Not good. I watched unicyclists, got a unicycle, and tried teaching myself. Really not good. I’m not too bad at tightrope, and while I’ve never had a tiger to train, I think I’d manage. 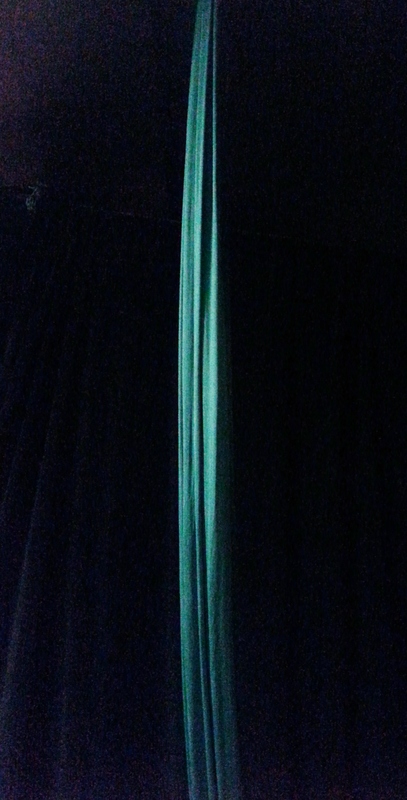 When aerial dance came on the scene, I knew I wanted to try that, too. 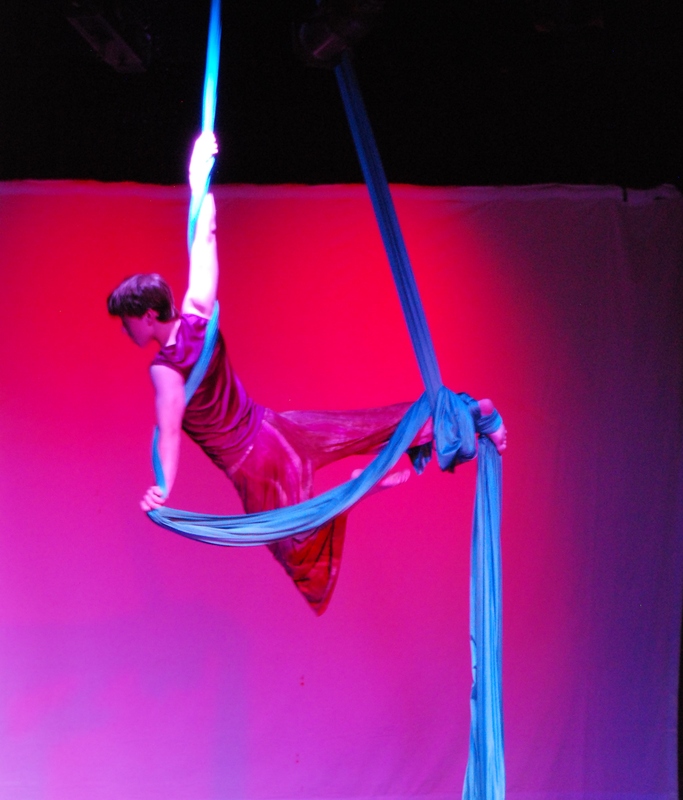 A relatively new art form, aerial dance (sometimes referred to as aerial tissu or aerial silks) is a form of movement that involves climbing and posing your body on fabric that is suspended from the ceiling. It was developed by Montreal’s peerless Cirque du Soleil in the mid-nineties as a means of exploring dance and contortion without the limitation of gravity. 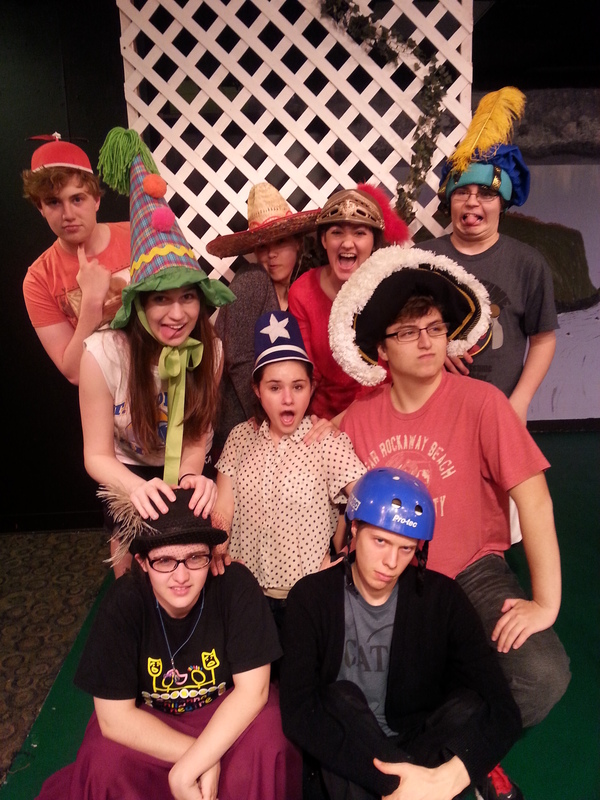 The first opportunity I had to play with them was at SETC in Chattanooga, TN. Not being known for my patience, I immediately spoke with the director about taking lessons and asked her how she got her start. Her answer? “I saw them in the circus, so I bought some fabric and taught myself.” We got along pretty well. First lesson back in the day! Whee! Last year, when we were choosing our 2013-2014 season, our Artistic Director had only one criteria for each show. 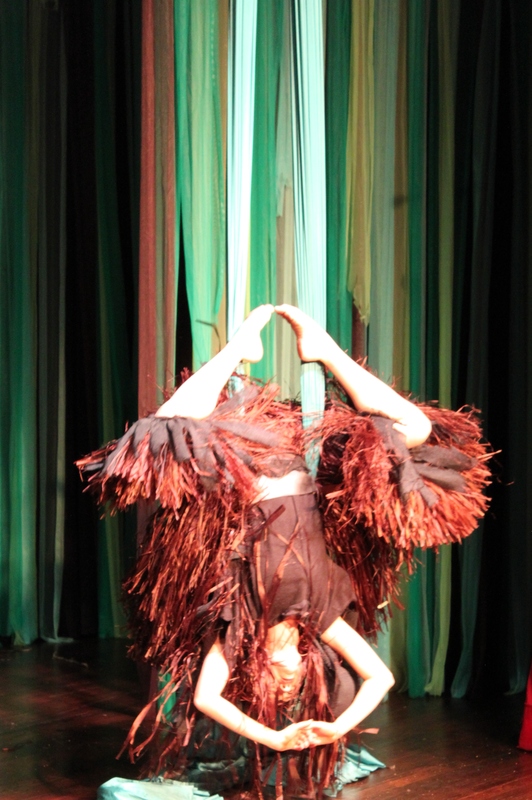 Every production had to include some element that we, as a theatre, had never used before. 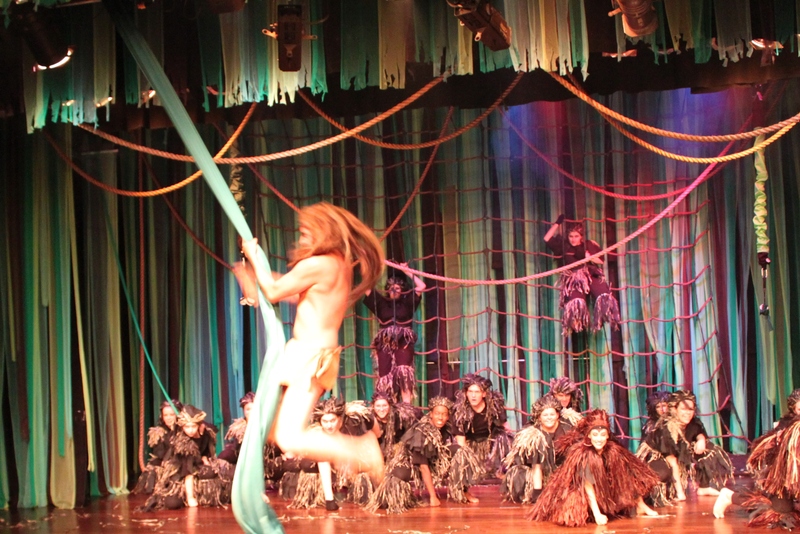 After settling on Tarzan and Shrek as our Main Stage shows, we decided to make Tarzan vertical. 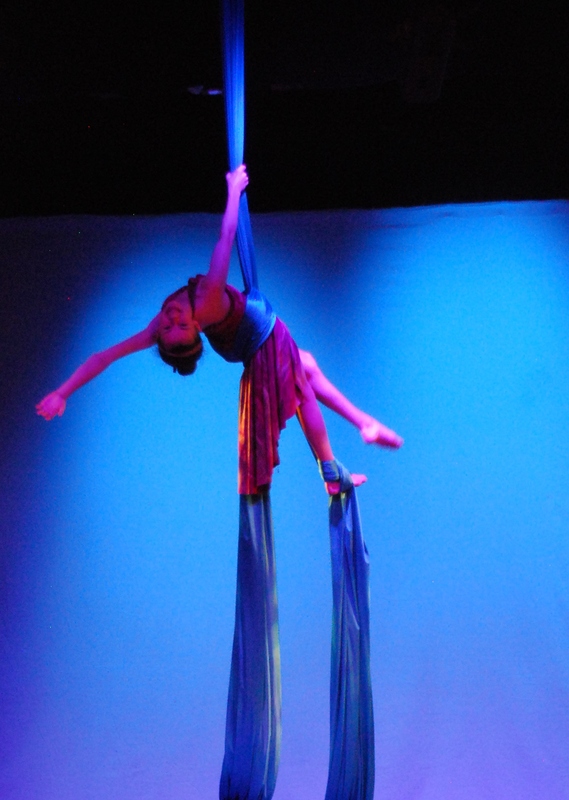 Utilizing the silks as vines and climbing nets as the jungle canopy, we took our show to new heights, and I fell in love with the aerial arts all over again. Less than a year later, our new aerial program has grown beyond our expectations! We have a Friday class that, truthfully, is the highlight of my week, and I have many students of all ages (10 to 55) who take private lessons. 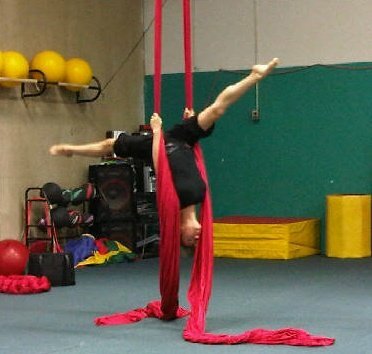 Soon, we hope to get a lyra (aerial hoop) as well! So what kind of person does aerial arts? Anyone. My group class (ages 10-18) includes a 5th-grade gymnast and an 11th-grade baritone. In my private lessons I have taught a massage therapist, a news anchor, and a fitness instructor, among others. The one thing all of these people have in common is their desire to experience something new. Of course, like any physical activity, there are some requirements. The rig does have a weight limit, and since you are binding your body with fabric you want to make sure you are in good health, with no prone to dizziness, circulatory disorders or severe skin conditions. A fear of heights could be a potential setback, but as these things go, our rig is pretty low with a maximum ceiling height of fifteen feet. 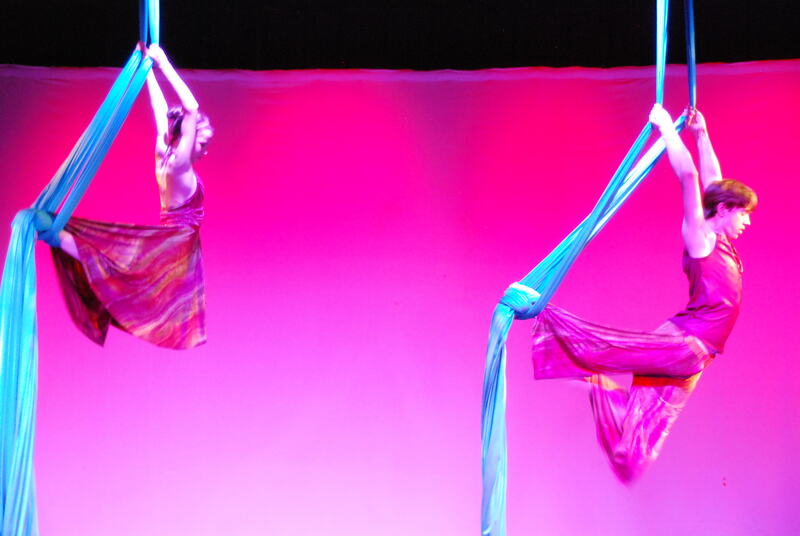 This year, we’ll be using our silks in two different dance shows. The first is the student-choreographed Jack and the Beanstalk in February, and the second is our annual dance showcase in May. The theme for 2015 is Dance Around the World, featuring dance styles from all over the globe. Never has Canada been so cool.